This week over at Cupcake inspirations we were given a colour challenge and as I was lucky enough to win some digi images from A day for Daisies for this card a couple of weeks ago ,decided to use theminside my cocktail glasses.I really quite like the effect reminds me of a mimosa cocktail we had on holiday!! I diecut the glasses out and added acetate behind them to mimic glass. I coloured them as close as I could to this weeks challenge using rose pink and yellow promarkers ..except I didnt have the light green :( so had to go darker for the stems. I liked the sparkle on the inspiration photo so I added a wink of stella on the flowers and the butterfly before mounting it on a darker pink and finally on black . Thanks so much for popping in for a look! Your card is so fun! 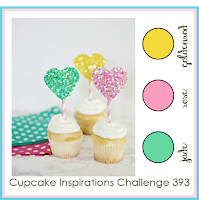 Thank you for joining our challenge this week over at Cupcake Inspirations. Jenni, this is darling ... cheers to a wonderful card - and, yes, I would have a mimosa at 11:00 a.m.! Wow, what a pretty card. There is some many beautiful things about it. Thank you for joining us this week at Cupcake Inspirations.